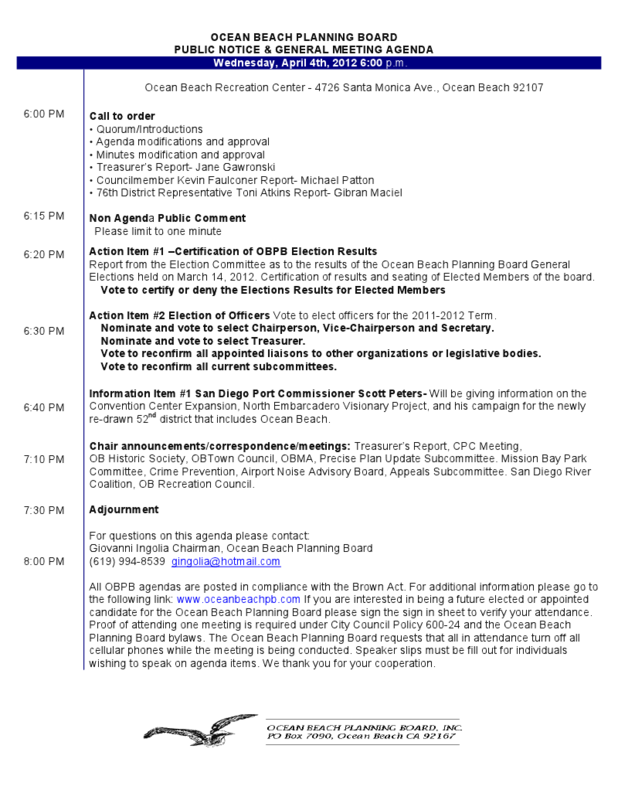 On Wednesday, April 4th, at their regular monthly meeting, the Ocean Beach Planning Board will elect new officers for the next year. The selection of Chair, Vice-Chair, and Secretary – the principle positions – is an annual ritual completed after the latest annual Board election. The election was held on March 13th, and the Board will presumptively certify the election results. Also on the agenda is Scott Peters, who ostensibly, is giving a report on news from the San Diego Port District because he is a Port Commissioner. But as we all know, Scott Peters is also running for the Congressional seat in the 52nd District, which does include OB. So, he’ll be there to expound on his campaign. Peter’s Democratic opponent, former Assemblywoman Lori Saldana, will not be there. Peters is expected to report on the Convention Center expansion and the North Embarcadero “Visionary Project”. The Board meeting will be at 6:00 pm sharp and will be held at the OB Recreation Center, located at 4726 Santa Monica Avenue. Here is the official agenda.